Angels and demons make for excellent characters in pop culture mythology. At least in the comic book Hellblazers that Constantine is based on. There are suave demons jiving to underground in smoky, dim-lit nightclubs, and spandex-suited angels who chastise you with 4-letter words when you commit ungodly acts. Expectedly, therefore, Constantine manages to steal the show with its look – sophisticated, groovy, capable of getting under your skin, and engorging your senses to bursting like a Las Vegas pantomime. You shake your head to the rhythm of the background score, you laugh out loud when exorcist Constantine (Keanu Reeves) points his middle finger at Satan himself (move over Damien Karras), and you strain hard to catch the mathematical intricacies that determine whether you will be banished to hell or exalted to heaven at the time of reckoning. But when two hours are past, you feel more like you are through with one episode of a post-modernistic soap about biblical characters rather than a full-fledged, emotionally gratifying movie. In other words, Constantine wins all its battles intact, but does not even make it in time for the war. Director Lawrence seems to have polished to shining, every single shot of the movie like an individual pearl, but with what was probably overconfident oversight, he completely forgot to string them together. The story of the chain-smoking exorcist Constantine, who is trying to buy his way to heaven by deporting evil half-breed demons back to hell where they belong, gets sketchier and sketchier as the movie builds up. Angela Dodson (Rachel Weisz), the cop, has a mentally ill twin Isabelle who commits suicide. And that is suspicious because Isabelle is a devout catholic who believes she will go to hell if she takes away her own life. So Angela goes out to investigate, and enlists Constantine’s help because she thinks her sister was brainwashed and he would know because he is into all this stuff. Gabriel (Tilda Swyndon) is an angel going evil, and keeps hopping in and out of the scenes with warnings and advice for the exorcist. He, in turn, has his own set of super troopers (Djimon Hounsou, Max Baker) who burnish his armaments, cover-fire for him, do his background research, and, as a job hazard, lay their lives on the line for him as well. More often than not, there is the feel of Constantine being a morbid version of Ghostbusters. There are the ghost-busting manuals and best practices for the technique and chemistry, there is the Bible with the history, there are the custom-made weapons (bullet shavings from the Pope’s assassination attempt, dragon breath and screech beetles) and there is the grand plan to resurrect the nether world. Of course, if Ghostbusters is the godfather, The Exorcist is the genetic father. There is the possessed girl who has to be tied to bed and mouths Latin curses, and instead of ‘Power of Christ compels you’, there is some similar gibberish Latin chanting. The graphics, while lending a helping hand to the entire look of the film, don’t break new ground, and make only a flicker of an impression on you. Hell is depicted as a blazing, Judgement Day like scene, and the view of thousands of tortured humans is disappointingly brief. 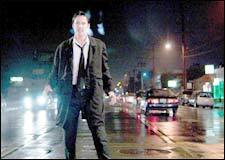 Keanu Reeves is probably the only thing you will go watch this movie for. From Speed to the Matrix movies to Constantine, he makes that small incremental jump in velocity. You see a different dimension of the same guy, but the change is neither too jarring nor too boring. He wears a black suit and tie, chain-smokes, and whispers way under his breath as he goes around on his rampage to pitchfork the wriggling demons. The boyish looks, the desperate struggle against his slide down to hell and the scarred, hardened, outer shell, all combine to turn him into a rather endearingly vulnerable demon-slayer. I certainly know why the girls are coming to watch this movie. As for the guys, I hate to say this, but leave your brains at home. If Satan and God could ever be part of a masala movie, well, this is the one. You won’t be disappointed, but you won’t come back again either. A rare gem that polishes the definition of HORROR in its truest sense. Forgive the fact the Keanu does not have the Blonde hair as the character should (which is based on comics), rest is a kick-a$$ ride with plenty of thought and character. Catch this ONLY on big screen! fullhyd.com has 700,000+ monthly visits. Tell Hyderabad what you feel about Constantine!